After being away from Bangladesh for more than 4 years now, I miss my mother, my best friend and the aromatic kitchens of my aunts. When I was growing up we only had one fast food joint called “Swiss Bakery” (later there were fast food places in every nock and corner). It was very near my home on Bailey Road, where the sophisticated shoppers would come for Saree’s (An outfit that all married Bangali women would wear), to look for the best in Bangali literature in a book shop named “Tobuo Boi Porun” (Still Keep of Reading Books) and to watch latest show at the theatre. Swiss Bakery was at the heart of Baily Road where they sold chicken sandwiches, beef pies, chicken in pastry, and sweets. It was rather a gourmet affair at the time. I feel silly today for craving all the baked goods from Swiss Bakery. Although they were good, but what I miss today if a good meal cooked by my mother or my aunts. Sometimes I can tell whose cooking it is by smelling the food. When you enter their house around lunch or dinner time, the aromas you will smell from their kitchen is unforgettable. Both my mother and my aunts did their own grocery shopping from the local market also known as Bazaar. Sometimes the hawkers would come around our house shouting (rather rhythmically) out the names of the vegetables that they were carrying. The LUXURY! And the entertaining part of it all was when you get to see them bargain. Ah…well, let’s not go there and reveal family secrets. Once shopping was done the preparation of spices, vegetables, fish or chicken would begin. You can hear the chatting in the kitchen, the sound of grinding, pounding. slicing, sizzling and stirring of the spoon in a “karai” (pot). Best of all, the cooking aroma from the kitchen towards the end would sometimes giveaway what would be for lunch or dinner. One aroma that I always remember fondly is that of a Panch Phoron that literally means Five Spices or five flavours. This is a rare treat only when you visit a Bangali home. Although is may does resemble a spice mixture used in South Indian or Sri Lankan cooking when they temper their lentil soups or dals. 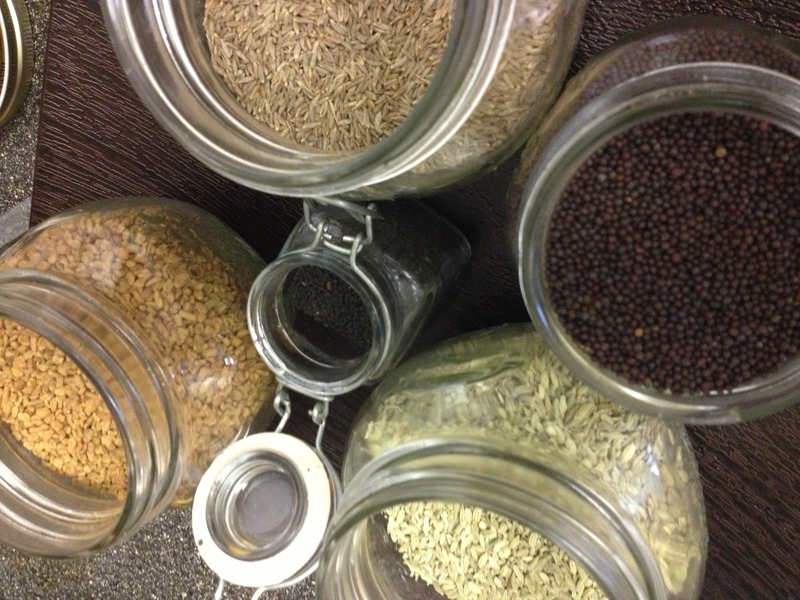 Pach Phoron is a delicate blend of five spices – cumin, mustard seeds, fennel. fenugreek and nigella seeds. Every Bangali make their own and keep it in their kitchen to prepare tempering for lentil soups, make “shada torkari” (assorted white vegetables – because no other spice will be used), and to make a simple vegetable dish. You can make a single vegetable taste like flavour bursting in your mouth by simple adding the Panch Phoron. The array of vegetables that can be used to go with Panch Phoron are eggplants, spinach, yam, bitter gourd, bottle gourd, beans etc. – just to begin with. You can add it to mangoes to make flavourful chutney. The best thing about Panch Phoron is – it does not need to be grinded. It is one of a kind spice mix that is a blend of five whole spices. Panch phoron is super easy to make, because all you do is mix all the five ingredients in a bowl and store it in a jar, untoasted. Keep it in a cool place that is away from heat and light. Wow! It is that easy. That means no cooking, grinding or toasting required. You can use Panch Phoron at the beginning of cooking vegetables, so the flavours of the spices are coated very well with the vegetables. Or you can “temper” Panch Phoron in cooking oil separately and add the hot spice into a dal or soup. Tempering in a method where you fry spices in a separate pan and add the hot spices on top of the cooked food. It is also popularly known as “tarka” in South East Asia. In a karai or pan heat 2 tsp. of mustard oil or ghee until it reaches a smoking point. Add 1 tsp. of the five spices and lower the heat to avoid burning and sputtering of the seeds. Once you smell the flavours turn of the heat and add it to you cooked dal or lentil soup. Or once the aroma of the spices are released sauté your favourite vegetables in the pot with the spices in them. Tips: When you are using Panch Phoron for dal as a tarka, add minced garlic, 1-2 bay leaves or 4-5 curry leaves to make the tarka extra delicious. YUM!! You will find all these spices in any Indian or South East Asian grocery store. You can also fine pre-packaged Panch Phoron. Because they are all whole spices, you can easily afford to buy it as a spice blend. Cumin (VPK): It is a cooling spice and is known as the “seeds of good digestion.” Cumin enhances absorption, supports digestion and metabolism without overheating the system. It is a good source of iron and manganese. Fennel (VPK): A cooling spice that gently stimulates the digestive fire or HCl, without creating body heat. An excellent source of vitamin C, it is also a very good of dietary fiber, potassium, manganese, folate, and molybdenum. Fenugreek (VK): Support fat metabolism, increase break milk in mothers with newly born babies. Mustard Seeds (VK): It contains selenium and omega-3 fatty acids. It is an excellent source of iron, zinc, magnesium, manganese, calcium, phosphorus, niacin, protein and dietary fiber. It is also known for its anti-inflammatory properties. Nigella Seeds (VK): Balances the hormonal system, adds a unique flavor, and balances the subdosas of the colon and stomach. I find this is the most commonly used spice in our kitchen. My husband’s new found love of Panch Phoron is so much that I often run out of it. Panch Phoron not only adds a different dimension in your cooking but also sweetens the cooking oil when you are frying it. Note the all the spices in the blend are seeds. I feel that this spice blend is mostly suitable for Vata, and Kapha dosha. I tried to make it Tri doshi by reducing the amounts of mustard and fenugreek. I have lowered the proportion of the fenugreek because it is bitter and mustard because it is pungent. I promise to share one great recipes using Panch Phoron in my upcoming blog posts.